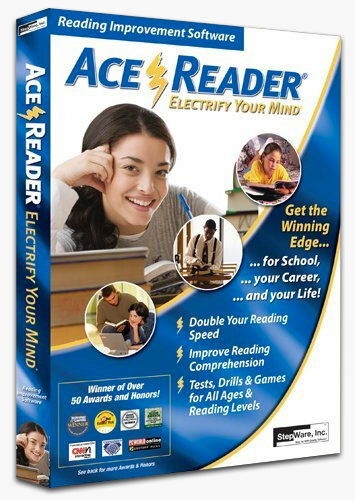 Download a 30-Day Free Trial of the original desktop version of AceReader. We want our customers to be fully satisfied and we feel the best way to see the value of this award winning product is to take if for a free test drive. Also know that support is a top priority with us, so don't hesitate to call or email any time. Call: 800-223-7323, ext. 2, Email: support@stepware.com. The Demo version has a 30 day expiration. More Tests: The Registered Elite version comes with 761 additional reading/comprehension tests that are broken out by grade levels (1-12+) for a total of 830 tests. The Registered version does not have the higher speed limitation. The Registered version does not have course activity limits. The Registered version does not have the initial registration screen that pops up when AceReader is started. We have been working with industry professionals, educators, reading specialists, for years to perfect this product, but your voice matters. If with 30-days of using AceReader you do not feel 100% satisfied with your purchase, please contact us for a full refund.